I'm constantly searching for some fashion inspiration, because I'm in a Big Fat Fashion Dip. Honestly, not only a fashion dip. Things just don't go as the way they used to go, you know. Appointments are cancelled last minute, the weather is still sucky and I don't have inspiration for anything: my thesis nor my fashion. Yesterday I had a few appointments for my thesis in Amsterdam, but my teachers were sick so I stayed home. The coming days I'm busy with work, I hope that will give me some new energy and inspiration. I tried to get my mood up by looking at some pretty fashion piccs. I noticed I saw many minty colors and they appeal to me. 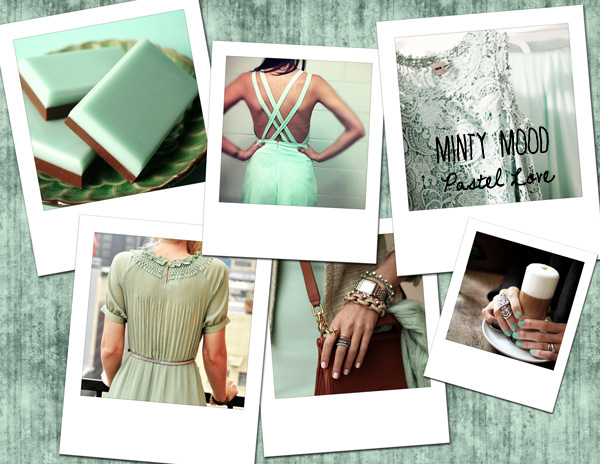 When my mood and money is back, it's time for shopping search for some cute minty items!